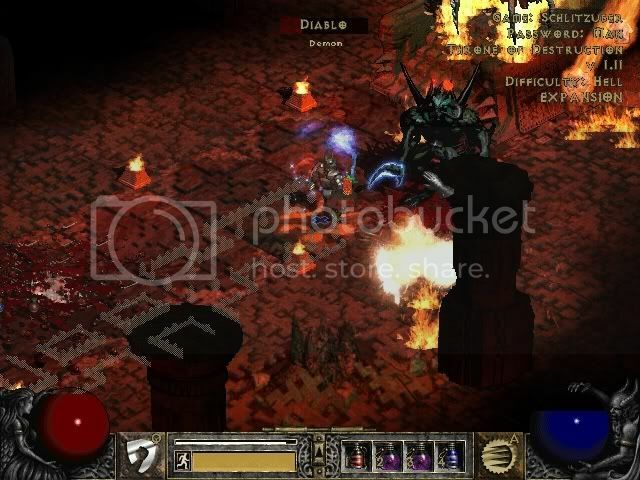 Discussion in 'Diablo 2 Community Forum' started by beeranon, Nov 18, 2006. Last night, I ran the ubers for the first time (got this torch :laugh: ), and just hated to leave the game...had successfully killed ubers solo (thanks kingdryland for your 1-pt smiter guide) and got a pally +3/18/16 torch to boot. I decide to do a Baal run while my daughter goes to sleep, but come across a pile of OKs in WS3 and blow it off and go to bed. This morning I get a up and tp back down and carefully work my way through (only 1 group of champion IM casters) and go down and clear the throne room and wait for Colenzo to appear...guess who pops in? "Surprised" really doesn't accurately describe my reaction. Congrats on the Torch and Anni. It looks like I have to start leaving games overnight more often. oh man, imagine if you killed minions then waited overnight to fight baal XD that'd be amazing....i need to start hunting him and just take snapshots of him at the weirdest locations. Diablo's ghost defends Baal to the death! The game should be called Baal II. Imagine how much easier uber trist would be if meph turned into dclone...not only that but anni and torch at the same time! Congrats!! I sure loved my first ubers kill. So much excitement! And man did it ever pay off for you! !